Gamifying Your Institution: What You Need to Know. Interactive games at your institution. Why do they matter? Sure, they engage visitors… but, what’s so great about them? Today I'd like to share why interactive games are so useful for attracting and engaging your key demographics. Who Do Games Appeal To and What the Heck are the '3 E's'? Essentially, mobile games are an incredible way to attract, engage, and connect with two visitor demographics: millennials and families. Interactive games are a great way to check all 3 of these boxes simultaneously. What Value Do Games Offer? Games are ubiquitous. There’s a reason that over 75% of people in the US are gamers. The science is in, and it shows that games are a great way to develop and hone cognitive skills, and foster learning while providing good entertainment. In fact, the Federation of American Scientists (FAS) says that games are the best way to learn. Performance, effort, and knowledge all increase from educational games. Visitors want to be educated through diverse, entertaining experiences -- but you have to entertain them before you can educate them. Remember that monotonous teacher you had in school, the one that could find a way to make any topic uninteresting? That is what happens when you don't provide entertainment with your educative experience. Games are a great way to offer an engaging, educational, and interactive experience, especially to millennials and families. When mobile games are done right, they allow visitors of all ages to play, with content that is accessible, engaging and educative. Truly engaging information can change your attitude or viewpoint or provide you with an epiphany. In short: it can be a transformative experience, with a caveat. You must engage and entertain visitors before you can educate them. The Moulin Rouge has officially joined CloudGuide! This iconic location in Paris, France is considered to be one of the most prestigious cabarets in the world. So it is to no surprise why most of you might have already heard of the name Le Moulin Rouge once before. The history of this famous location dates back to the early 1889, during a period that can be described by its non chalance, light-heartedness and 'joie de vivre', the period we call The Belle Époque. With over 100 years of history, this establishment has been a great contribution in shaping one of France's greatest periods of artistics and cultural growth. 3 Ways to Double Your Institution's Mobile App Uptake. As we know, much research has shown that millennial and families desire an immersive, engaging, and digitized experience when visiting museums. This is why so many institutions have considered going digital! But one common question they have asked themselves is the following "Why do most museum mobile apps have low uptake rates "?. This is an extremely important question to ask before digitizing, So, if you happen to have asked yourself the same thing, then you are not alone as this is a very common issue and one you do not want to run into after investing thousands of dollars in a mobile application. On that note, we would like to share a few important numbers with you, as well as the best practices to generate 1.5x-2x more visitor uptake of your mobile application. The first thing to note is that the average audioguide has an uptake percentage of around 12% at the maximum – that’s assuming you do everything right. The average mobile application isn’t much higher, at 17%. The average mobile app has an uptake of 17% because most institutions just don’t know how to effectively communicate the presence of their mobile app to visitors. - Mobile app with multimedia guide (texts, images, audioguide, videos): 25-35%. - Mobile app with multimedia guide and interactive games (treasure hunts, puzzles, quizzes): 35-40%. Our communication strategy produces an uptake rate that is far and away better than the industry average. 1 - Have the mobile application front and center on your website with a working link to download it. Make it the first thing that a visitor sees, especially on their mobile device. 2 - Place a banner at the front entrance with a QR code and weblink to download your mobile application. 3 - Place stickers with QR codes and weblinks around your institution. 1 sticker per 5-10 stops will ensure that people see it, download it, and use it. 4 - (optional) Kick your feet up on your desk, breathe a sigh of relief, and then take a sip of your coffee (or tea. no judgement...well, maybe a little). CloudGuide is excited to welcome the BOZAR Museum! 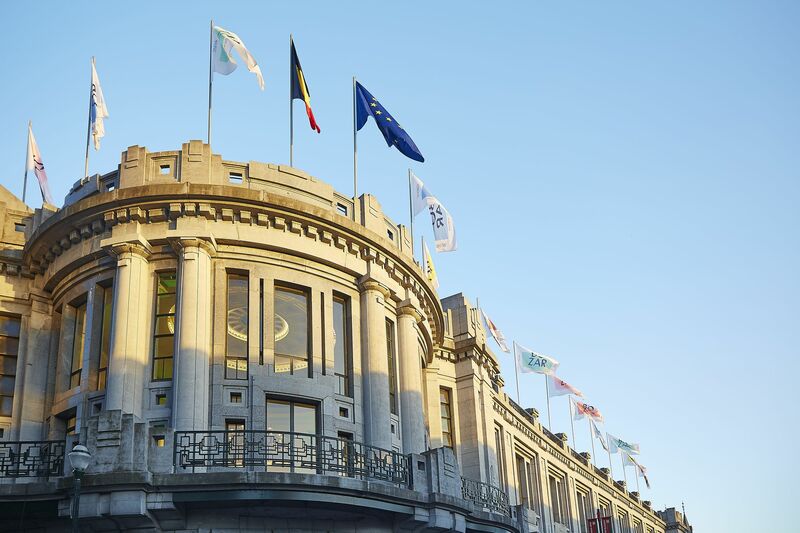 A recent and exciting addition to the CloudGuide community, the Centre for Fine Arts (BOZAR) situated in the center of the Mont des Arts is one of the most visited cultural destinations in Brussels. This architectural masterpiece designed by Victor Horta opened its doors in 1928, and has since then become an important cultural institution hosting some of the most original exhibitions, shows and concerts. So when visiting Belgium, do not forget to take a look at our collaborative work in creating the BOZAR audioguide based on their exhibition "A Hot Hip-Hop Summer #YOBRUSSELS". 35 years after its arrival on the streets of New York, hip-hop is taking over the prestigious Centre for Fine Arts. #yobrussels is an immersive experience which tells the story of Brussels hip-hop. CloudGuide launches a brand new feature! CloudGuide is excited to announce the launching of its new feature, which allows its users to send Museum Selfies and Postcards from the mobile app. As we all know, technology has revolutionized the way society engages on a day-to-day basis. The self-portrait of the digital age, the selfie, has changed the way we connect with museums and cultural attractions from around the world. Nowadays, there is rapid growing preference for online conversation to be communicated through images rather than words, and museums are embracing this. With selfies becoming the latest form of self-expression, museum selfies have followed the trend and grown in popularity. CloudGuide wants to go one step further by engaging museum visitors and allowing them to take selfies while at the same time, seeking out additional information about the exhibition. Integrating selfies and postcards, CloudGuide aims to change how cultural institutions currently use technology. From now on, visitors will be able to send real postcards with the images of the site, exhibit selfies, to their beloved ones, sharing experience, having fun and learning at the same time. On the other hand, institutions should embrace the fact that selfies have become part of the museum-visiting experience and use this phenomenon to push the educative path of personalised guided tours inside of the app, boost connection with their visitors and get to know them better through analytics.